Upper Level Low Generates Downpours, Hail and Thousands of Lightning Strikes. La Nina Conditions Return, But Will La Nina Persist? A dynamic cutoff upper low centered over Southern California produced numerous thunderstorms in Southern California and a broad area of the southwestern U.S. Saturday. The thunderstorms produced thousands of lightning strikes, some heavy downpours, hail and strong winds. 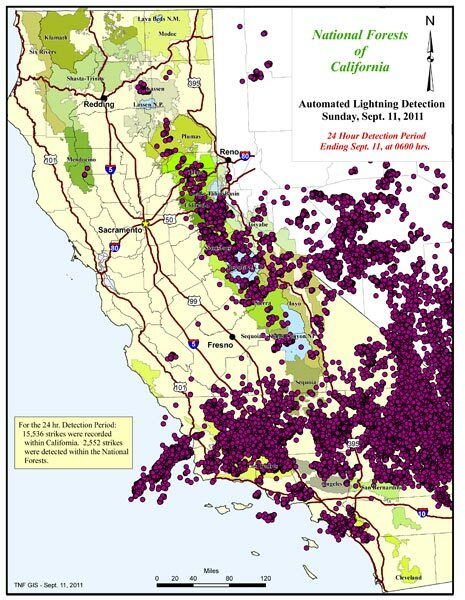 Thunderstorms were widespread in Southern California and several strong thunderstorms were reported by the NWS. This NWS NEXRAD image from about noon on Saturday shows several strong cells including one area flagged as severe. This composite image from WSI/Intellicast.com at 2:45 pm PDT shows estimated cloud tops, cell movement and hail. Half inch hail was reported in several locations by NWS spotters and there was one report of 1.25 inch hail near Lake Los Angeles. 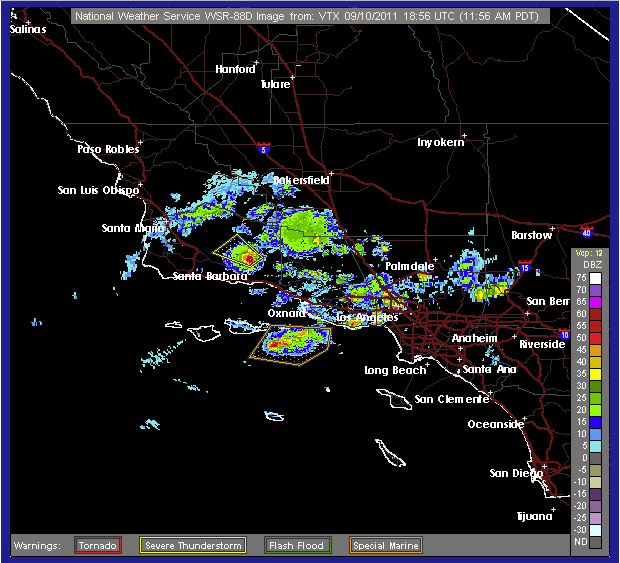 A wide swath of enhanced thunderstorm activity developed in the afternoon to the north and northeast of Los Angeles. Some of the higher rainfall totals reported by the NWS include Lake Palmdale at 0.98 inch; Palmdale 0.84 inch and Lockwood Valley 0.58 inch. Downtown Los Angeles recorded a trace. Here's a NWS Los Angeles/Oxnard tabulation of some rainfall totals from around the area. Here also is a NWS San Joaquin Valley/Hanford tabulation of some rainfall totals in the southern San Joaquin Valley and Sierra. 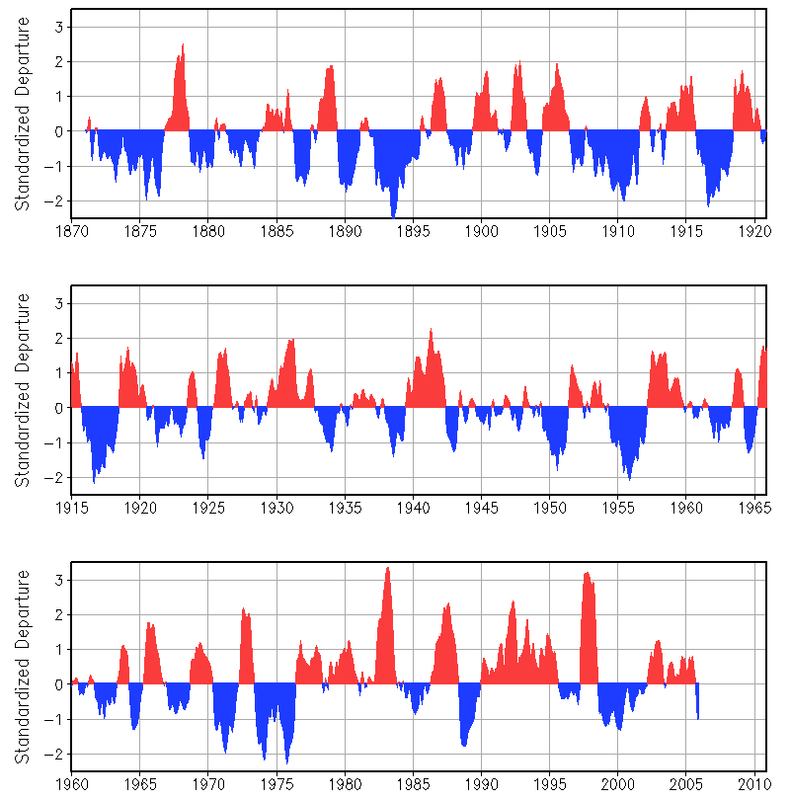 In a Southern California Weathernotes post in February I commented that the tough question regarding La Niña was whether warming would continue into the NH summer, with neutral ENSO conditions prevailing as we move into autumn; or if the ENSO cycle would swing back toward a La Nina state. It was noted that since 1949, about half of the first year La Nina episodes have continued into a second or third year. Climate scientist and Multivariate ENSO Index (MEI) codeveloper Klaus Wolter first mentioned the roughly 50/50 chance that La Nina would return following a summer respite in September 2010. A glance at a plot of the extended MEI index, going back to 1871 clearly shows a propensity for a return of La Nina in the year (or years) following stronger La Nina episodes. In a September 8, 2011 press release NOAA reported that La Nina is back. More precisely, in their September 8 ENSO Diagnostic Discussion CPC states "La Niña conditions have returned and are expected to gradually strengthen and continue into the Northern Hemisphere winter 2011-12." The Multivariate ENSO Index (MEI) has dropped below the weak La Nina threshold, and several oceanic and atmospheric factors are indicative of a reemerging La Nina. There's still a (historically) slight chance of a return to ENSO neutral conditions this fall, but it doesn't appear likely. We'll see!